Sacroiliac joint anatomy takes you on a little tour of the pelvis. This is quite unlike any other part in the body; amongst other reasons because the SIJ surfaces are covered by two different kinds of cartilage. Like all true joints, there is cartilage on both bones, but the articular faces have both glassy hyaline and spongy fibro cartilage surfaces that rub against each other. 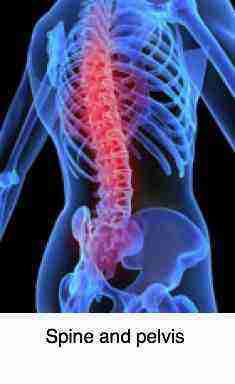 No other joints in the body have this feature. There are also has many large ridges and depressions that fit together like the pieces in a puzzle. Motion palpation is the key to the treatment of the SIJ. Whilst it's a controversial tool, the astute examiner can clearly palpate whether the SIJ is in motion or not. By placing one thumb on the sacrum, and the other on the ilium, and then asking the patient to raise the knee, it's not difficult to decide whether the joint is fixated or not. Unlike most other joints, the sacroiliac joint anatomy is not designed for large movements. The rocking movements made with every step are in fact very small. This pelvic joint usually only moves about two to four millimeters during weight bearing and forward flexion. It is a viscoelastic joint, meaning that its major movement comes from giving or stretching. Furthermore, it is common for the sacroiliac joint to become even more stiff and actually lock, usually due to injury, but also due to prolonged sitting, for example. This explains why manipulation is the treatment of choice for the very painful sacroiliac joint syndrome. Orthopaedic surgeons, researching arthritis in knees and hips make the following statement: Mechanical factors, including joint instability and malalignment, contribute to the progressive degeneration that characterizes hip and knee arthritis. Would that apply to the sacroiliac joint? Yes, indeed. Another factor is a difference in leg length. If one leg is shorter, the opposite sacroiliac joint tends to be fixated. Just how much constitutes a significant leg length inequality remains controversial, but my own opinion is that sometimes as little as two or three millimetres can be significant. In some instances the lift should in the shoe, and if more than ten millimetres then in the sole. I spent a very fine hour and a half this week having dinner at a street cafe in the little Dutch town of Koudum. 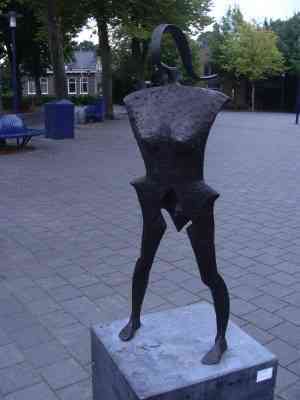 The long summer evening was enriched by this fine bronze. See the little triangle between her legs? 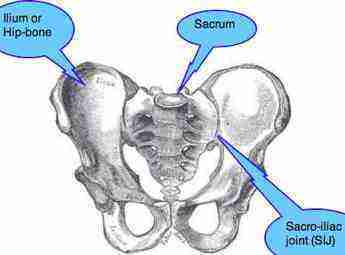 That's the sacrum not a chastity belt; it makes up one of the three bones in sacroiliac joint anatomy. This is the last of five copies. Roughly two thousand dollars if my memory serves me correctly and it's yours. Since the van Gogh debacle they now reward their artists handsomely. Mobilization may also be useful for keeping the joint loose using certain specific exercises and stretches; they are an important feature of the rehabilitative phase of the treatment. Expect to be given exercises and do them faithfully if you want to get better and stay better. 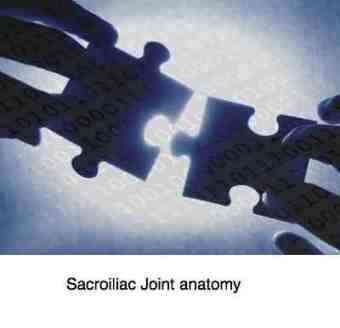 The medical fraternity have for years denied that the sacroiliac joint is a movable joint. Finally, science has prevailed, and chiropractic philosophy has been vindicated. Reducing the malalignment in the joint, we believe, will reduce not only the pain in the joint, but also reduce progressive degenerative changes associated with all fixated joints. Sacroiliac joint treatment is a vital part of the management of hip arthritis too. There is without a doubt a connection between chronic fixations in the sacroiliac joint anatomy, and hip arthritis. Every case of hip arthritis that I find has a concommitent sacroiliac joint fixation. However, what we haven't yet discovered is whether the fixation causes the hip arthritis, or the hip arthritis the sacroiliac joint fixation. It's a chicken and egg situation; probably both occur. What is also certain is that many cases of so called failed hip surgery are not surgical failures. The surgeon did a fine job, but because the sacroiliac joint fixation has not been corrected, chronic buttock pain continues. Sometimes it's because the surgeon using poor technique created a leg length inequality. Post hip surgery, the Thompson drop technique is highly effective for treating the fixation and an orthotic in the shoe may be necessary to equate leg length. Groin and pubic bone pain are common complaints and, in the female, it's an awkward condition faced in the chiropractic help clinic. It's best to take a companion with you as you will surely be required to remove your trousers. There are many possible causes of upper thigh discomfort, some related to sacroiliac joint anatomy, or even a Maigne's syndrome; that's a facet syndrome in the high lumbar spine. Now a little anecdote from the chiropractic coalface. A seventy year old woman consulted me this week for neck pain. Unconnected, she still has difficulty walking since a hip replacement 18 months ago. The surgeon insists that the hip is fine. Eureka; all four sacroiliac joint orthopedic tests were positive. More, there was a profound jamming of the sacroiliac joint on motion palpation. I say unconnected. Could the still locked up sacroiliac joint be the underlying cause of her neck pain? Perhaps. My advice is, before going for a hip replacement, give your chiropractor two months to work with your hip. It may save you the surgery, and freeing up the sacroiliac joint will make the surgeon's work so much more effective in any case. Remember housewives, there's much to be done to prevent prostate cancer. Strong research repeated four times shows that men who eat a tomato a day have fifty percent less prostate cancer. Add the avocado and you reduce another nasty; benign prostatic hypertrophy. Prostate cancer has a high tendency to spread to bone, especially the pelvis. Sacroiliac joint anatomy is important to everyone of us. 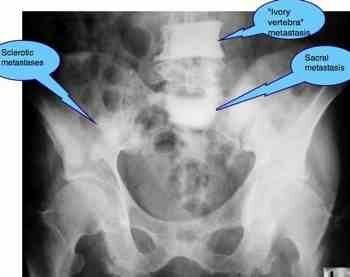 See the so called ivory vertebra and metastasis in the sacrum? If you have sacro-iliac joint anatomy pain, are a male and over 45, then your chiropractor will probably ask some questions about the health of your prostate. Prevention is the key. Sitting on your wallet gives you a curvature whilst sitting, walking with a backpocket wallet pulls unevenly on your pelvis. BACK POCKET WALLET is worth a consideration of you are suffering from low back pain. 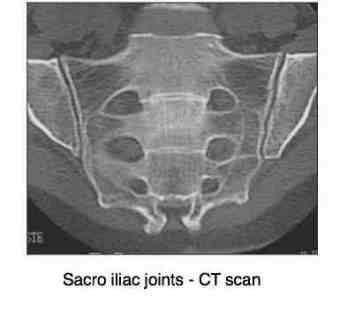 Sacroiliac Joint Case file. An interesting case of a woman who has had a hip replacement followed by severe lower back pain. Go from SACROILIAC JOINT ANATOMY back to SACROILIAC JOINT treatment. Turn up the volume. You'll love this from Youtube! Wonderful, wonderful, no, not Copenhagen, but Nutritional Value of MUSHROOMS. Cancer prevention. Inspirational Stories Read inspirational stories of tenacious patients who ultimately experience the fruit of their patience, and chiropractors who against all odds have succeeded. Read more … INSPIRATIONAL STORIES.